In the article you will find some basic information About Goldfish Care. Proper goldfish care is vital to keeping goldfish for an extended period of time. Since goldfish have a long life expectancy – anywhere from 5-10 years – you can have them as pets for many years as long as you take care of them and their living environment. Before you bring your goldfish home, it is important to consider what you will need to do in order to maintain good goldfish care. As long as you correctly feed your goldfish and keep the tank clean and well-balanced, you can look forward to a long and happy experience. 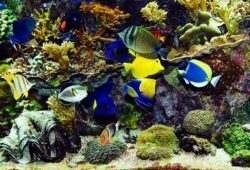 Any time you start an aquarium in your home, it is wise to get all of the materials together and in place before you add the fish. First decide whether or not you will be using gravel in the tank. 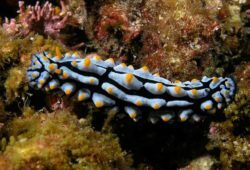 This is also the time to select any plants and decorations for your aquarium. Goldfish are not the neatest of fish to keep, so if you do use gravel, keep it in a thin layer to make maintaining a clean tank easier. You also have to thoroughly clean all of the gravel, decorations and plants you will put in the tank. When choosing a tank, get one big enough for your goldfish to be comfortable in, and it’s a nice touch to give them a couple of hiding places as well. Once you have acquired all of your goldfish aquarium accessories, it is time to focus on the water. Goldfish can live happily in room temperature water, and they can withstand temperature fluctuations of more than 10 degrees as long as they are not too sudden. Commonly, a water heater is not required for goldfish care, but some water preparation is. Water straight from the tap contains chlorine, which is not at all good for your new goldfish. It is recommended that you treat the tap water with a dechlorinator once you fill the tank, then hook up the filter and let it run for a few days before introducing any goldfish. Even though getting a new goldfish tank is exciting, it is important that you have patience and do not add too many fish too quickly. In fact, it is recommended that you start your tank with just one or two goldfish. This is because fish release ammonia into the water, and in a new, unconditioned aquarium the ammonia can rise to dangerous levels if you add too many fish before beneficial bacteria have had a chance to build up. Add your first goldfish to the tank, and then wait a month or so before introducing any more. 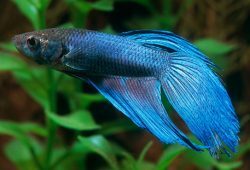 You can also help condition the tank during the first week by changing out about a quarter of the water every few days. Another major consideration when it comes to goldfish care is food. You can buy goldfish food at the pet store when you purchase your goldfish. 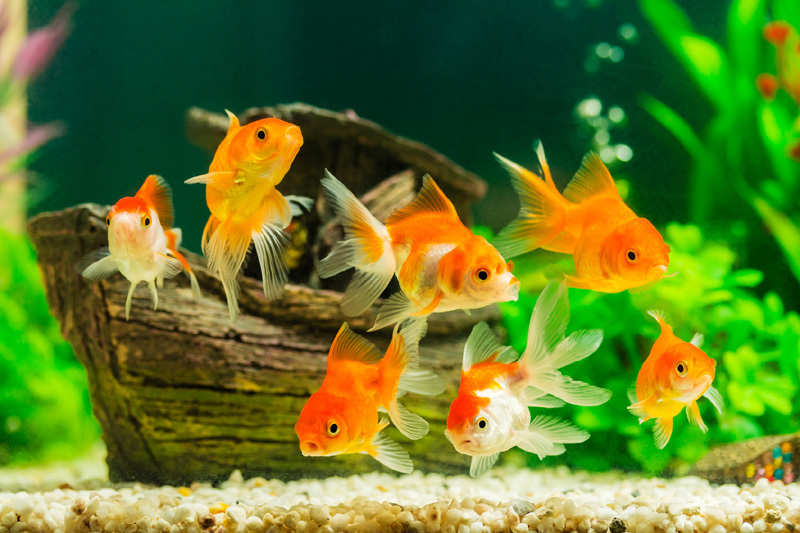 It is important that you never overfeed your goldfish, as any uneaten food collects on the bottom of the tank and could become toxic to your goldfish if it builds up. You should feed your goldfish a minimal amount of food two times per day, or just follow the instructions on the label of your goldfish food. Observe your goldfish at feeding time, if they don’t consume all of the food within a few minutes, you are feeding them too much. The water in your new goldfish aquarium has to complete what is called a nitrogen cycle, during which time the water inside the tank may appear cloudy for a few days. Refrain from introducing any new goldfish to the aquarium if the water doesn’t look right. Once the water becomes clear again, you will know that the nitrogen cycle has begun to work. When purchasing your new goldfish, don’t forget to consider their final size. Many goldfish can grow to be quite large, so be sure not to overcrowd the tank with too many goldfish. If you follow these general guidelines for proper goldfish care, you will have a fun and fulfilling goldfish experience.